Draws Every Thursday, Friday, Saturday and Sunday from 7.30PM. As long as you are a paid up member you are in the draw. 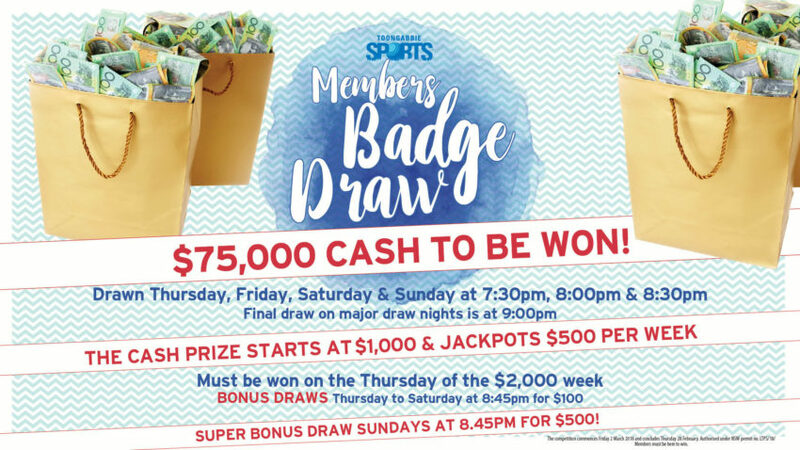 At 7.30PM, 8.00PM and 8.30PM we will draw one badge number and if they are at the club they will win the jackpot – Minimum of $1000. If it’s not won we then do a draw from the members who have been at the club since 6.30PM and give away $100. SUNDAY now has a $500 CASH PRIZE EVERY WEEK! Jackpot increases $500 per week and must be won on the Thursday the Jackpot is at $2,000 – GUARANTEED!